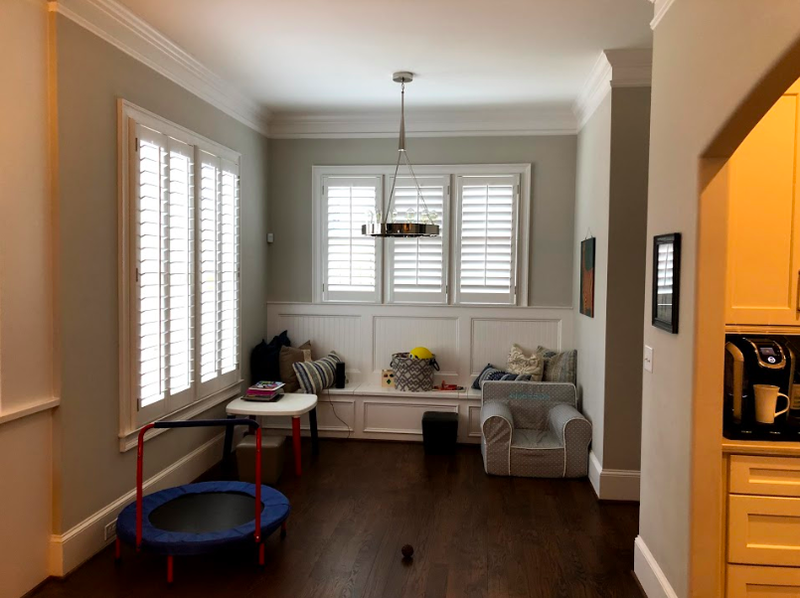 Most family homes have a space that is poorly or completely unused because its purpose is not clearly defined, or the family simply doesn’t use it for its intended purpose. In this home, it was the breakfast nook, adjacent to the kitchen, which tended to collect large toys and other miscellaneous items. So my clients decided to reclaim their breakfast nook and brought me in to help. 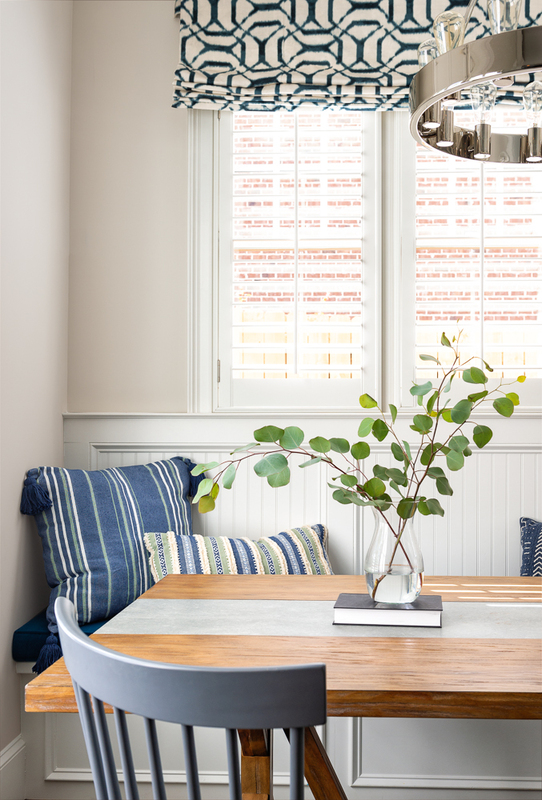 Though the space was clearly begging to be a cozy breakfast nook, the family was using it as a repository for large toys and other random items. Fortunately, the room had great bones, with nice hardwood floors, tall baseboards, a great built-in banquette with bead board panels, and a gorgeous modern chrome chandelier. 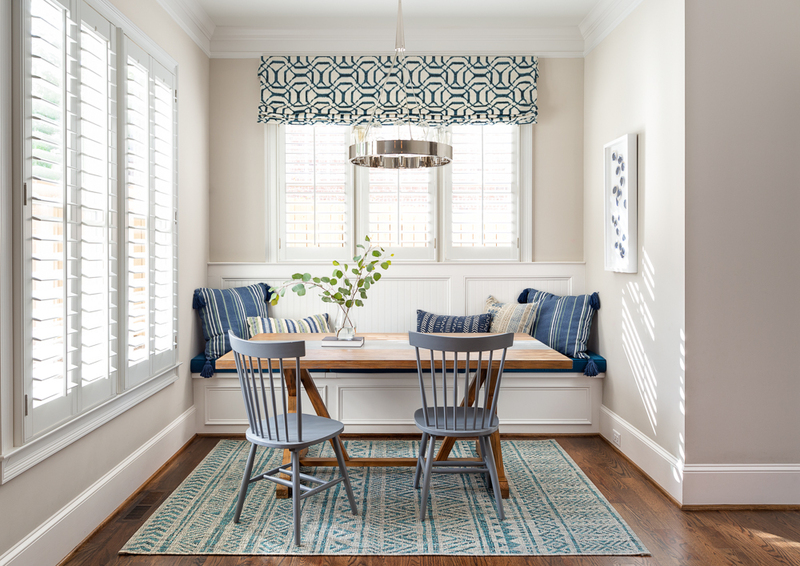 Building on these elements, we took the eye up with a navy, graphic-print Roman shade. Then we added a beautiful patterned indoor/outdoor rug that can easily be hosed off outside if the errant meatball rolls onto it during a lively spaghetti dinner. 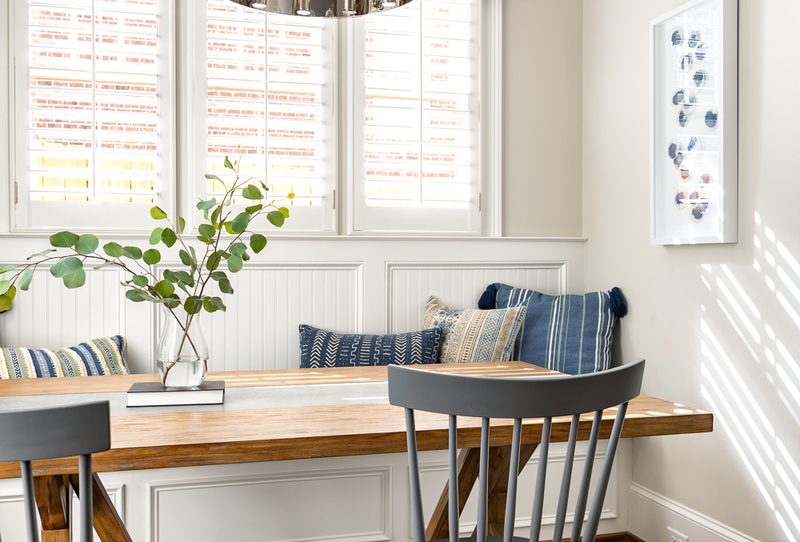 We brought in a wood-and-concrete trestle table that fits the space perfectly and comfortably provides seating for the whole family, with wooden spindle chairs that can be easily wiped down. For the banquette, we had custom cushions made with Crypton fabric, so they’re practically indestructible. Throw pillows contribute to the easy comfort and style of space, and a few understated accessories round out the room’s vibe. Pancakes are ready—come and get ’em!